Dubai, UAE, September 26, 2018: Retail Pioneer ‘Union Coop’ is organizing a unique ‘meet n’ greet’ tour for their consumers in their ‘Etihad Mall’ and ‘Al Barsha’ Mall, Dubai respectively. Veteran cricket legends ‘Mr. Wasim Akram’ and ‘Mr. Mohammad Azharuddin’ Shall Welcome their fans during the visit and attending a press conference, wherein they will be answering press questions. 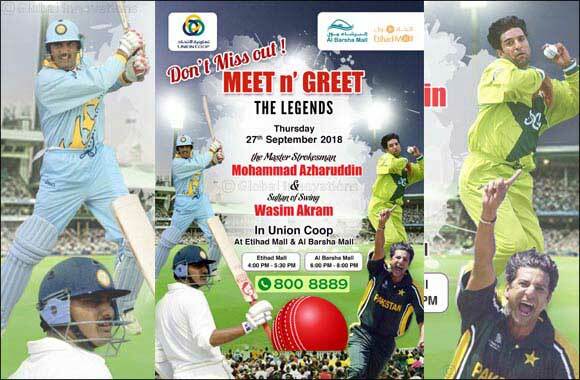 The event will be held on September 27th 2018, Thursday at Etihad Mall (4:00 pm to 6:00 pm), Meet n’ Greet tour.